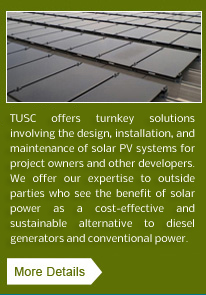 In addition to power generation, TUSC provides technical design, procurement and installation of solar PV systems for third party owners. Such systems can be located in urban areas (grid-tied) where solar power displaces more expensive and price-volatile grid power, and in remote areas such as islands where solar power displaces highly expensive power sourced from diesel generators and provides numerous environmental and health benefits such as zero carbon footprint, zero pollution and zero noise. 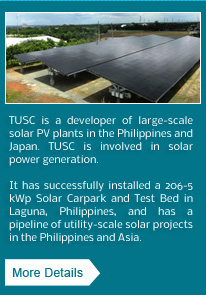 TUSC has successfully installed and commissioned a several grid-tied solar systems including a 100 kWp solar rooftop installation in a manufacturing facility, a 65 kWp solar rooftop system in a university, a 20.5 kWp solar rooftop installation in a commercial destablishment, and a 10.78 kWp residential solar rooftop system. 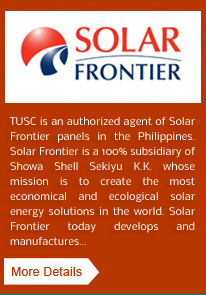 TUSC has also commissioned the first-ever purely renewable charging station for e-vehicles in the country, a 14 kWp battery-backed solar charging station in Boracay Island.